A blog to track my attempts to earn extra cash, and save money, so I can be a Stay At Home Mum as long as possible! Since my last post I've made some headway, of sorts, well of miniscule sorts! I've only been to a couple of garage sales, mainly due to our 4 month old daughter deciding that Saturday mornings around 7-8am are the perfect time for a screaming 'give me milk' session. So my plan of being the early bird catching worms has been a bit delayed! 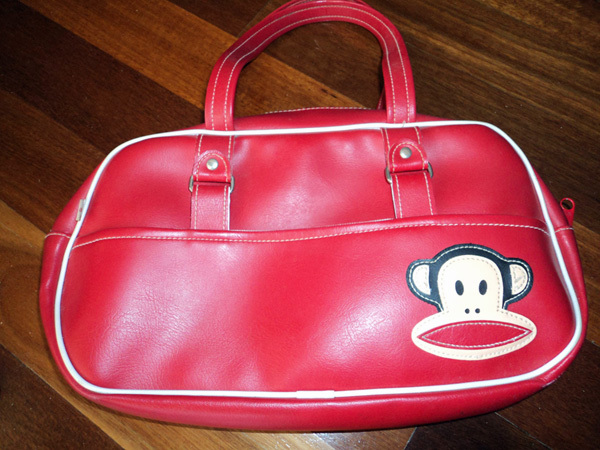 I picked up this Paul Frank handbag for $2 at a garage sale, I thought it was funky, and I'm sure I've seen the 'monkey face' logo in shops. I think I'll list it on a local Facebook page first and see how I go, rather than Ebay & Gumtree, I think it's a funky little bag that might appeal to the Facebookers. The local sale page seems to have a good audience, and things sell pretty quick, so it hopefully will be a winner! We shall see. If it doesn't sell I'm going to give it to our 6 year old neice as a Xmas pressie, so while I wouldn't make money on it, I'll save some of the usual $50 per kid spend that the extended family has in place. I've added a permanent tracker to the blog (top right) where I'll update my buy/sell/profit/loss info. I have my eye on an antique cabinet at a local seller that I think is way underpriced, but not sure if I'm willing to back my judgement and outlay the $180 as yet, it's a big chunk of my $250 budget, but if my research pans out, I might just give it a go!!! On the 'savings' side of things, I put my sewing machine to good use and sewed up the split seams in 2 pairs of my leggins, that I previously probably (ok definitely) would have thrown out and replaced, so I've saved us $49.00 x 2, I had black cotton, and was able to get 30 mins while bubs slept to take the sewing machine to the laundry and sew in isolation so I wouldn't wake bub! Yay. It's amazing where you can cut corners when you put your mind to it. It was my hubby's birthday on the weekend, and rather than spending up big on steaks for the bbq lunch I bought a big chunk of silverside/corned beef, and a lamb shoulder from our local butcher, and slow cooked them both for the lunch, they were a huge hit, with 3 of hubby's mates wives asking for the recipes. And the best part was instead of spending $100+ on meat for the bbq (steak, sausages, hamburgers), I spent $48 on the lamb & beef from our local butcher, and put them on at 6am after bubs feed, by lunch at 1pm they were melt in the mouth delicious! About me? I'm a Scorpio, I love walks on the beach......no seriously I am and I do but the real deal is, I'm late 30's, live in the Hunter Valley, Australia with my husband "Mr Mel", our baby daughter (born May 2012) and our pug. Am originally from country Victoria and lived in Melbourne for over 10 years prior to moving up here. Mr Mel's family live in Sydney, my family are in Vic. Can we do it.....Yep we can! All comments, photos, thoughts are those of Stay At Home Mum To The Rescue, unless otherwise stated. Awesome Inc. theme. Theme images by imacon. Powered by Blogger.